CNG-powered two-wheelers could be a reality soon since the government is currently validating the feasibility of natural gas propelled scooters. The government of India has launched a unique way to curb the increasing pollution levels in New Delhi by launching compressed natural gas (CNG) kits for two-wheelers. Before the project takes off, the ministry has launched a pilot programme of 50 Honda Activa scooters retrofitted with CNG kits. The first lot of scooters will be run in and around the town by none other than Domino’s Pizza delivery guys! Findings from the pilot lot - like emissions, performance and efficiency of these scooters - will determine the future of the CNG kits for general public. These CNG kits are manufactured by the Indian division of Iranian firm Ituk Manufacturing, and are approved by Automotive Research Association of India (ARAI) and Transport Department as well NCT of Delhi. 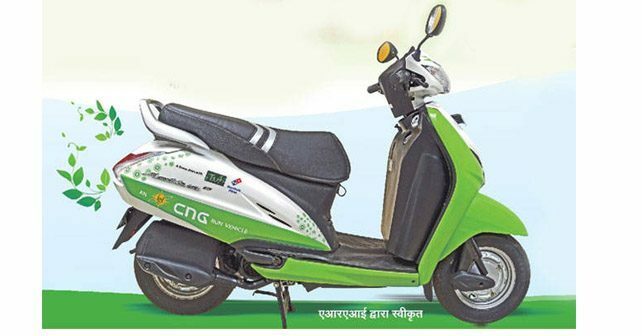 The CNG kit retrofitted in scooters comprises two CNG cylinders of 4.8-litre water capacity each, which can be filled up with 1 kg of CNG each. The ministry claims the scooter to return a mileage of 120 kilometers in a single fill while also being substantially economical and a lot more environment-friendly. As per idle emission test carried out by the authorities, the hydrocarbon emissions from CNG retrofitted two wheelers are 75 per cent lesser and carbon monoxide emissions are 20 per cent lesser as compared to petrol driven models. There’s no doubt that CNG is a popular choice of propulsion among private car owners, fleet operators, autorickshaws drivers in Delhi/NCR. Not only are CNG propelled vehicles easy on the pocket, CNG in itself is a substantially cleaner fuel for the environment. However, introducing CNG kits for two-wheelers will also call for a major push in the refueling infrastructure of the city.